Season ground chicken, if desired, with salt and pepper. Heat oil in 12- inch nonstick skillet over medium-high heat and cook chicken, stirring frequently, until chicken is thoroughly cooked, about 6 minutes. Remove from heat and stir in lime juice. Meanwhile, prepare Knorr Pasta Sides according to package directions. To serve, toss cooked chicken with hot pasta. Arrange lettuce leaves on platter. 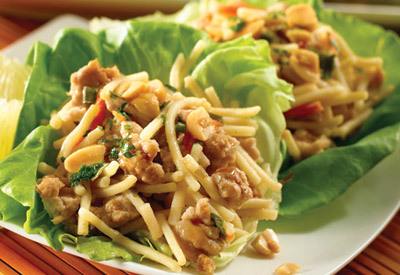 Evenly fill lettuce with chicken mixture. Sprinkle with chopped peanuts and cilantro. Serve, if desired, with lime wedges.